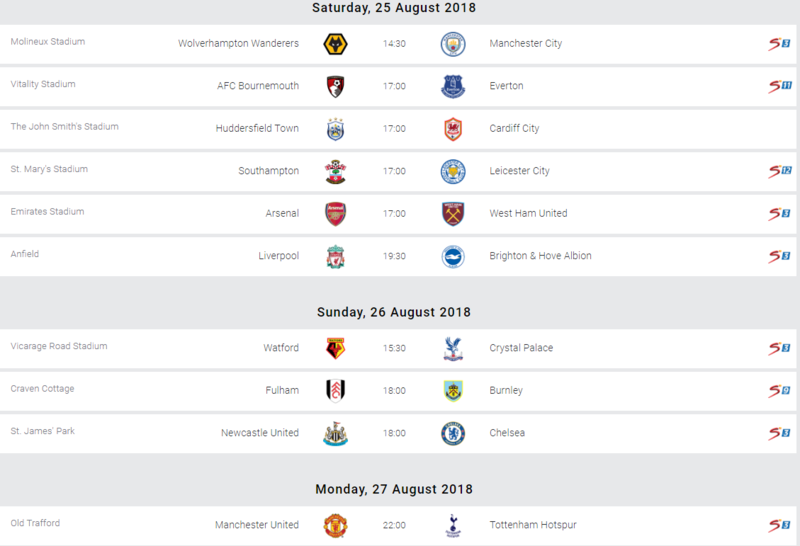 Man City will be hoping they continue their fine start to the current Premier League season when they travel to newcomers Wolves at lunch time on Saturday. Goalkeeper Claudio Bravo is set for a lengthy absence after tearing his Achilles tendon and as a result, the Citizens have recalled Montenegrin Aro Muric, 19, from a loan spell at NAC Breda. Either Muric or 20-year-old Daniel Grimshaw will be on the substitute’s bench at Molineux. Wolves wing-back Matt Doherty is expected to be fit despite being forced off with an injury against Leicester. Club record signing Adama Traore could make his first start after impressing as a substitute last weekend. Wolves’ first ever Premier League win came against Manchester City in October 2003 at Molineux. They also beat City 2-1 at home in 2010, but those are their only victories in eight Premier League games against the Blues (W2, D1, L5). The sides drew 0-0 in the Carabao Cup last October, with City eventually going through at the Etihad Stadium on penalties. Wolves were one of only two teams that City failed to score against last season, along with Wigan Athletic (who beat Pep Guardiola’s side 1-0 in the FA Cup). Bournemouth’s record signing Jefferson Lerma may be included after proving his fitness for their under-21 side in midweek. Kyle Taylor and Junior Stanislas are still injured and Diego Rico is banned. For Everton, boss Marco Silva says new signings Andre Gomes and Yerry Mina will not be fit until mid-September.Morgan Schneiderlin misses out with a muscle problem and Phil Jagielka is still banned, but Lucas Digne and Bernard could feature. Everton are yet to win in three Premier League games at Bournemouth. Their six meetings in the Premier League have produced 25 goals. Bournemouth have won just two of the previous 11 meetings between the sides. Arsenal have lost their first two game of a league season for the first time in over 20 years and they will be hoping they can kick-start their campaign when they host fellow Londoners-West Ham United. Gunners head coach Unai Emery has said he has no new injury concerns ahead of Saturday’s game against West Ham. Carl Jenkinson, Sead Kolasinac, Laurent Koscielny and Ainsley Maitland-Niles are long-term absentees. West Ham who are also yet to register a point will be with out captain Mark Noble who has been unable to train this week because of a back injury. Striker Andy Carroll, midfielder Manuel Lanzini and defender Winston Reid are all still out. Arsenal have lost just one of their last 22 matches against West Ham in all competitions (W17, D4). The Hammers have lost 28 Premier League games to Arsenal, more than against any other team. However, West Ham’s tally of five Premier League away wins at Arsenal is surpassed only by Manchester United (eight) and Liverpool (seven). This is the first time Arsenal and West Ham have both started the same top-flight season with consecutive losses. Huddersfield Town welcome back Aaron Mooy, who was absent for the birth of his son last weekend. Fellow midfielder Jonathan Hogg could feature after overcoming a hip issue, while Danny Williams and Mathias Jorgensen are also in contention. Cardiff City winger Junior Hoilett should be available despite being substituted against Newcastle because of a groin strain. Midfielder Aron Gunnarsson is still out with a knee injury. Huddersfield’s only win in the past 12 meetings was 1-0 at home in a Division Two game in 2003 (D2, L9). Cardiff are on a four-game winning streak against Huddersfield, including a 3-0 away victory during Huddersfield’s promotion season in 2016-17. The Terriers have not faced Cardiff in a top-flight clash since they lost 2-1 at Leeds Road in February 1956. Southampton winger Mohamed Elyounoussi could feature after missing the defeat by Everton with a hamstring problem. Defender Jannik Vestergaard has recovered from a virus. Leicester forward Jamie Vardy begins a three-match ban for his red card against Wolves, with Kelechi Iheanacho or Shinji Okazaki likely to deputise.Midfielder Matty James remains out with an Achilles problem, while new signing Caglar Soyuncu is recovering from a hamstring injury. Southampton’s only win in the past seven top-flight meetings was 3-0 at home under Claude Puel in January 2017 (D3, L3). The Saints lost this fixture 4-1 last season, their heaviest home defeat by Leicester since 1967. However, the Foxes have won only three of their 23 top-flight matches at Southampton (D9, L11). Liverpool could name the same starting line-up for a third game in a row. Defender Dejan Lovren remains out, while Alex Oxlade-Chamberlain is a long-term absentee. Leon Balogun could make his first Brighton start as Lewis Dunk is a major doubt with an ankle injury sustained against Manchester United. Club captain Bruno is out with a hamstring injury, Jose Izquierdo is lacking fitness and new signing Florin Andone has a groin problem. Liverpool are unbeaten in seven games against Brighton in all competitions, winning the last five in a row. Brighton’s only victory at Anfield in nine league visits came in March 1982 when Andy Ritchie scored the game’s solitary goal (D1, L7). The Reds have scored 15 goals and conceded just two in the last three meetings in all competitions. The Seagulls have scored three own goals in their last three games with Liverpool. Watford striker Stefano Okaka is back in full training after a leg injury but may not be risked. Miguel Britos, Nathaniel Chalobah, Tom Cleverley and Gerard Deulofeu are all unavailable. Crystal Palace right-back Aaron Wan-Bissaka is banned for one game following a red card in the home defeat by Liverpool last weekend, with Joel Ward set to deputise. Connor Wickham is nearing a return after 21 months out with a knee injury. Watford have won just two of their last 16 matches against Crystal Palace, losing 10 and drawing four. Palace have lost only one of their last 13 league encounters at Vicarage Road, a 2-0 defeat in the Championship in 2009. Last season’s 0-0 stalemate at Watford was the first goalless draw in this fixture for 10 years. Alfie Mawson is still sidelined but is nearing a return from his injury, while Tim Ream and Floyd Ayite are both still doubts for the game. Denis Odoi returns from suspension though, and Andre Schurrle will be pushing for a return to action after being dropped last weekend. Tom Heaton returns from almost a year on the sidelines in midweek and could play here, but Nick Pope remains injured along with Steven Defour. Robbie Brady is a fitness doubt too. Burnley have won four, drawn one, and lost one of their last six meetings with Fulham, but the most recent was over two years ago in the Championship. Their only previous Premier League encounter at Craven Cottage saw Fulham win 3-0 in 2010. Fulham have failed to win either of their two Premier League games this season (L2) – they last started a Premier League campaign without winning any of their first three games back in 2011-12 (D1 L2). Chelsea captain Gary Cahill has yet to feature for Sarri this season and could have to wait a bit longer after the manager confirmed he would not play against Newcastle. Edin Hazard who has had a positive impact coming off the bench in the Blues’ first two games is expected to start on Sunday. DeAndre Yedlin has trained this week after being injured in the opening day loss to Tottenham and looks set to be involved, while Javier Manquillo – who replaced Yedlin against Cardiff – will be assessed. Benitez also confirmed that some of the new summer signings are close to starting as they improve their fitness. Newcastle United have won four of their last five home Premier League matches against Chelsea (D1), winning 3-0 on the final day of the 2017-18 campaign. Chelsea have lost 11 away Premier League games against Newcastle United, only losing more against Arsenal (12) and Liverpool (13).This will be 11th time a Newcastle vs Chelsea fixture has been played on a Sunday in the Premier League – Newcastle have only lost once (W4 D5) previously, a 5-0 drubbing in November 2003 at Stamford Bridge. Nemanja Matic and Antonio Valencia have been in training for more than a week and could give Mourinho a boost by making themselves fit to feature on Monday, meaning that Andreas Pereira and Luke Shaw may make way. After being given time to work his way back to fitness, Jesse Lingard appears ready to start for the first time since the World Cup, giving the hosts a far more direct option than the out-of-position Juan Mata on the right of a front three. Eric Bailly and Victor Lindelof came in for criticism for their display against Brighton, meanwhile, but it remains to be seen whether Phil Jones or Chris Smalling will be recalled to the starting lineup. In terms of the visiting side, Pochettino has no fresh injury concerns and may well opt to go with a settled starting lineup. Spurs went with a back three against Fulham, utilising the strengths of Ben Davis and Kierran Trippier out wide, while also shoehorning each of Davinson Sanchez, Jan Vertonghen and Toby Alderweireld into the side. Skipper Hugo Lloris was arrested for an alleged drink-driving offence on Friday morning, however, which could potentially mean a rare start for Michel Vorm. Man United have won 21 of their 26 home Premier League matches against Tottenham, including victories in each of the last four encounters without conceding a goal. In fact, Spurs have lost more Prem games at Old Trafford than any other team at any ground in the competition’s history. The home team has won this fixture on each of the last seven occasions since March 2015, compared to just seven of the previous 24 games.